A working group established to tackle sporadic anti-social behaviour in St. Columb’s Park is considering the installation of CCTV cameras in the ‘stadium’ area having identified alcohol as a major factor in recent disturbances, some of which were reportedly sectarian in nature. The St. Columb’s Park Working Group met with local residents who live in the surrounding area on Thursday, in St. Columb’s Park House to listen to their concerns, experiences, and garner ideas on how to address some of the current issues within the park. Helen Henderson from St Columb’s Park House said: “The potential for the park to be used as a space for education, recreation, arts and heritage, is significant and it is an important space for the wellbeing of our local residents. “Whilst many of the negative issues in the park are complex and not always contained solely to the park area, a common theme identified by the group is the consumption of alcohol. “Violence is more likely to occur and escalate when alcohol is involved and people can be left vulnerable. 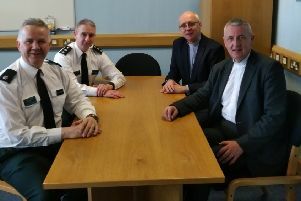 Chief Inspector Paul McCracken added: “There is clearly a lot of goodwill in the city from a range of organisations and individuals who want to play a role in ensuring this public space is used in a positive way and local police are more than willing to play our part to make sure park users are safe. Mayor of Derry City and Strabane District Council, Colr. Maolíosa McHugh said he welcomed the partnership approach to dealing with the issues saying that collaborative working and communicating directly with young people to reinforce the safety message was the way forward. “We want everyone to be able to enjoy and to be safe in our parks and open spaces. By working together we can help change attitudes and behaviours and get the entire community to get involved in helping us resolve this problem,” he said. Alderman Drew Thompson, Chair of the Derry and Strabane PCSP added: “PCSP members are aware of the issues in and around the park and have discussed this with PSNI and our partners. The group are appealing to the general public to report anything that is criminal in the park immediately by calling police on 101 or in an emergency please dial 999. Alternatively you can call the Community Safety Warden on 07709457690. Early reporting can prevent further escalation.